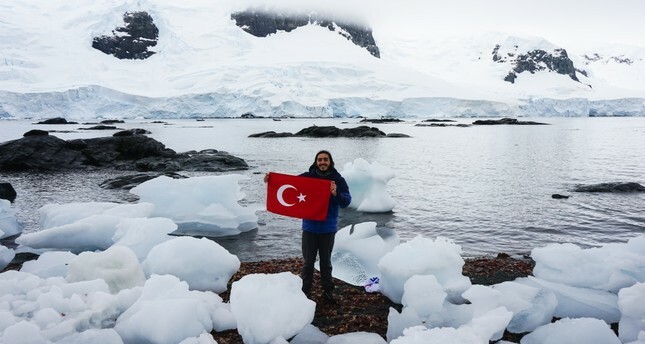 Barkın Özdemir traveled to Antarctica thanks to crowd funding. Bearing the title of the youngest Turk to set foot on all seven continents following his visit to Antarctica, Barkın Özdemir's photographs with penguins in the Earth's southernmost continent warranted thousands of likes on Instagram. Speaking to Anadolu Agency (AA) about his trip to Antarctica, Özdemir, 23, said he started to travel with the education credits he saved during his university years and that he was happy to go to Antarctica, the only continent he had yet to set foot. Özdemir stated that he traveled to Antarctica by finding dream partners through a crowd-funding campaign. "Although it is not very common in our country, I decided to try crowd funding. I wanted to give a message to Turkish youth rather than do something just for myself that 'dreams have no boundaries.' I did something crazy and opened the TL 20,000 [$3,230] fund for 60 days," Özdemir said. Recalling that when he opened the fund, he focused on three main goals. He said the initial purpose was to show that an ordinary college student at the age of 22 could create his/her own opportunities and travel the world and that anyone who wants to and dreams of following in his footsteps can. He also added that his second aim was to raise awareness of global warming; the third was the chance to travel to six continents. "There was only Antarctica left. If I set foot on this continent, I would win the title of the youngest Turk to set foot on all seven continents. We wondered who would support such a crazy idea, and we got TL 21,000 in 27 days alone. Some gave TL 20, some TL 5,000 ... The amount didn't matter, they were now a dream partner," he added. Özdemir said he visited 52 countries by saving his scholarships and that visiting Antarctica was more expensive. "Unfortunately, the minimum amount for a 10-day tour in Antarctica starts at $6,000. As Antarctica becomes more popular every year, prices are increasing on a yearly basis. Even if you try to negotiate, the companies generally don't budge because they target the luxury segment," Özdemir continued. "If you are looking for the cheapest route, you have two options. You will either purchase the tour one year in advance or take a risk by spending time in Ushuaia where the ships sail and catch last-minute discounts." Özdemir noted that he found a 20-day tour in Ushuaia for $9,500 instead of its usual price of $16,500 a week before the ship sailed, adding he first flew from Istanbul to Frankfurt and then to Buenos Aires. Özdemir said the agencies touring Antarctica are generally based in the United States and Canada. "The time difference and international telephone calls were very difficult from Turkey. After a week in Buenos Aires, I went to Ushuaia, the southernmost city in the world. I bought a last-minute tour there and sailed with 100 people a week later," he added. Highlighting that the internet and telephone did not work for 20 days starting from the moment they set out for Antarctica, Özdemir said the sun sets at 1 a.m., and you wake up at 4 a.m., adding you always have to look at your watch, since it might be 10 p.m. even if it feels like 7 a.m. "Traveling from place to place sometimes takes days, not hours. You are at sea in the middle of nowhere for three days. For the first time in my life, I completely emptied my mind; I didn't put down my pen for 20 days, and I wrote 250 pages," he continued. "I will publish my journal in the next few months. Of course, I will do it with the help of the precious stakeholders who support me. Most of it is ready, but I am trying to get permission from professors at the British Library to use photographs to tell the historical side." Özdemir said the island of South Georgia in Antarctica is very special, adding that the island is home to one of the world's largest penguin colonies. "One day, we came across the world's largest penguin colony. I was so happy, I cried. With 250,000 king penguins ... I saw a Pars Seal on his way to hunt, and I saw icebergs," he said. Özdemir had some advice for travelers planning to travel the world. "There is no such thing as never. You can do something if you really want it, and you need to make sacrifices. You are tested both physically and spiritually; and most importantly, when you really feel ready, take the steps to achieve this goal." The young traveler said he visited a total of 52 countries and left Antarctica off of the list. "No matter how much hardship I have been through, I have met more cheerful people than I have ever met in my entire life. South Africa will always hold a special place in my heart. I will never forget that while I was looking for my camera lost in the middle of the sea at sunset, I came across a school of dolphins and swam alongside them," Özdemir noted. Özdemir, an intern at a start-up firm in London, added that those who want to become travelers can reach him through his social media account.